What is a FLY & DRIVE offer? We have designed the Fly & Drive programs in a country where safety and comfort of roads are almost superior to European networks. We welcome the guest at the airport, deliver them the car the next day & our assistance 24 is always there to answer their queries while they are on the road. Standing 20 floors tall overlooking the Creek, this 3-star hotel is conveniently located in the quiet area of Al Maqtaa. The hotel is 15 minutes from downtown and close to all major business hubs and key leisure attraction of Abu Dhabi. Welcome to the land of Hospitality. 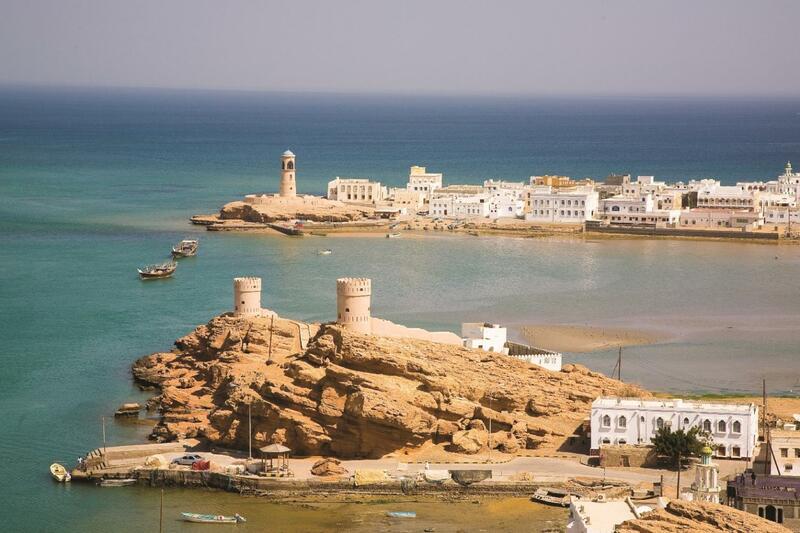 Oman is one of the most attractive travel destinations in the Middle East, a country that combines luxurious comfort and safety amidst rugged mountains, panoramic beaches and striking desertscapes. Tulip Inn Muscat the newest hotel in the area Located in the heart of Al Khuwair district welcomes you and your family in a truly relaxed atmosphere. Nestled on a pristine sandy beach, in the foothills of the rugged Hajar mountain ranges, it immerses guests to this legendary hideaway for its blend of natural beauty, romantic heritage and contemporary luxury. Arrival at DUBAI airport or ( possible arrival in AUH airport ). Meet & Greet by our representative. Transfer to your hotel by air conditioned vehicle. Check in & Overnight in DUBAI. Breakfast at your hotel. Delivery of your car and briefing by our Staff. Departure for Abu Dhabi city tour, the largest and the capital city of the United Arab Emirates. This comprehensive tour is the ideal introduction to the UAE capital and the island on which it stands. The name Abu Dhabi means: “Father of the Gazelle”. Stop first at Sheikh Zayed Grand mosque, one of the largest Mosques in the world; able to accommodate more than 30,000 worshipers. 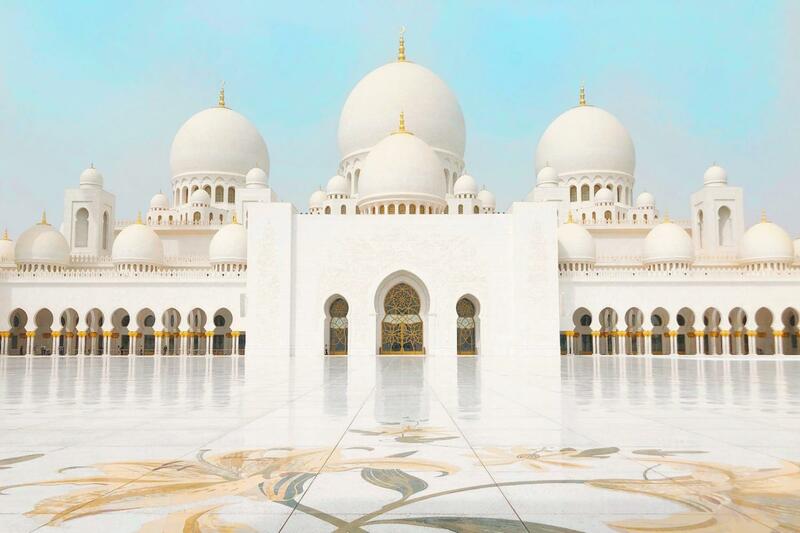 The beautiful Mosque is completely clad in marble and also features intricate Islamic decoration and carvings as well as extensive landscaping works. 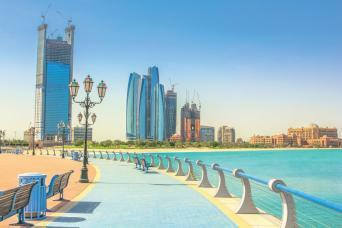 Continue the tour towards Abu Dhabi downtown. Pass through the old city or what we consider OLD today and pass by the oldest building in town, the palace of Al-Husn. 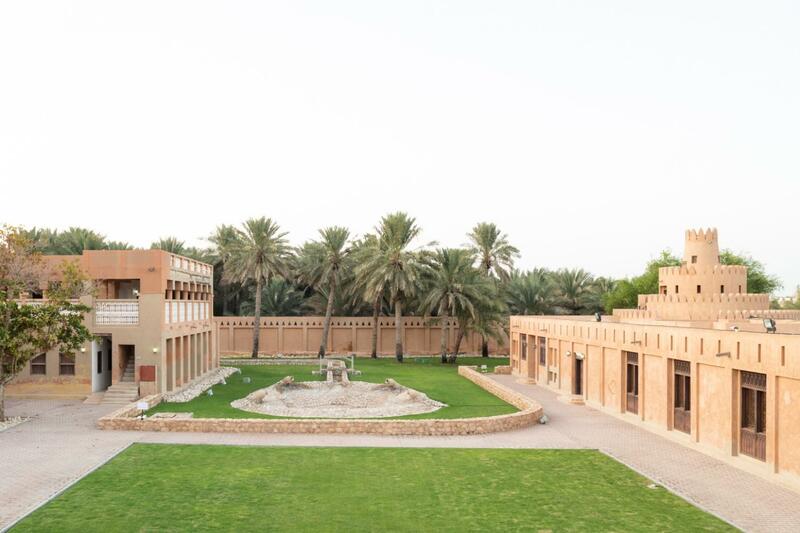 Proceed to the Heritage Village, which houses a small museum and depicts the traditional daily activities of the Arab community prior to the discovery of oil. Lunch can be taken in a local restaurant in Heritage village. In the afternoon, you can drive along the spectacular Corniche, past gleaming white mosques, glass-clad offices and elegant high-rise apartments to the tip of the breakwater for a superb view of the city’s magnificent skyline. The remaining part of the afternoon will be devoted to drive through the famous giant Saadiyat Island project where the LOUVRE museum and GUGGENHEIM museums are built to complete the image of ABU DHABI as a cultural city. Continue towards the famous Yas Island which houses the FORMULA 1 YAS circuit & the first attraction park of Ferrari in the world. An impressive attraction park, the largest covered air conditioned park in the world with a huge RED FERRARI sign as landmark. Overnight in Abu Dhabi. Breakfast at your hotel. Departure to the oasis city of Al Ain, located on the Hajjar Mountains. Al Ain is one of the oldest cities in the UAE, rich in traditions. For thousands of years the oasis of Al Ain has been an important caravan stop on the ancient trade routes across Arabia. You will visit the camel market, the largest in the UAE. Visit of Al Ain Palace, it is one the most important cultural places in Al Ain city. It is a direct testimony to the period of rule of the late Sheik Zayed Bin Sultan Al Nahyan in Al Ain and his original place of residence there. The Palace is also the birthplace of HH Sheikh Mohamad Bin Zayed Al Nahyan, the Crown Prince of the Emirate of Abu Dhabi. Visit of the Jahili fort, one of the largest castles in Al Ain and best-in-class example of the Islamic military architecture locally. After Lunch (own arrangement), proceed to visit the National Museum of Al Ain, where you will learn everything about the history of this region. In the afternoon, step back in time at the Hilli Gardens, famous for the archaeological excavations from the third millennium B.C. Transfer to the hotel and check in. Overnight in Al Ain. Breakfast at the hotel. Drive through the beautiful embassy quarter enroute the Sultan Qaboos Grand Mosque that has a remarkable architectural achievement. 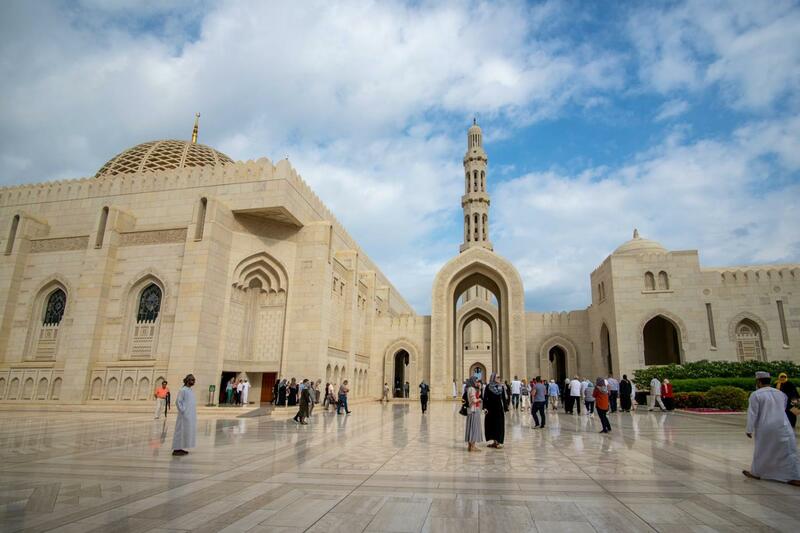 As a contemporary place of worship it serves as a spiritual landmark for modern Oman, projecting the values and aspirations of the Omani people. As an edifice, it maintains a perfect balance between aesthetics, culture and deeply rooted Islamic tradition. After the visit to the mosque , continue to Bait Baranda museum, which showcase the history of Muscat.Visit Old Muscat, surrounded by steep mountains and flanked by twin 16thcentury forts ‘Jalali’ & ‘Mirani’, also see the Al Alam Palace, His Majesty Sultan Qaboos’ residence. Proceed to Bait Al Zubair Museum. Bait Al Zubair is itself a part of Muscat heritage. Sheikh Al Zubair who served three former Sultans, founded the house in 1914 and his son Mohammad Al Zubair opened it as a museum in 1998. It’s carved doors opens up into a fortress style reception. The museum includes traditional Omani weaponry, jewellery, costumes, domestic utensils andrecreated urban and rural environments. Then drive through the scenic beauty of the corniche, stop at Muttrah - the main port & commercial centre, and explore the colorful historic souk. This is a real souk with winding alleys and backstreets and stalls selling all manner of textiles, jewelry, traditional Omani perfumes (bukhoor - made of frankincense), souvenirs and antiques… After that long tour , drive back to the hotel. Overnight in Muscat. Breakfast at your hotel. Departure for a half day guided tour. 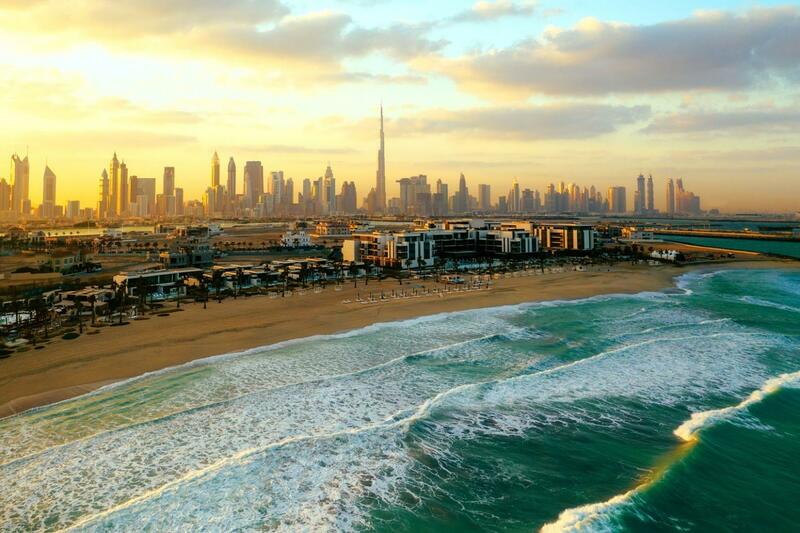 You will have the opportunity to discover the spectacular and lively metropolis of Dubai. The city, developed from a small fishing village at the Dubai Creek, nowadays presents itself as a glamorous metropolis at the Arabian Gulf. The distinctive skyscrapers and gigantic shopping-malls will impress every visitor. We start with Bastakyia, the old town district of Dubai. 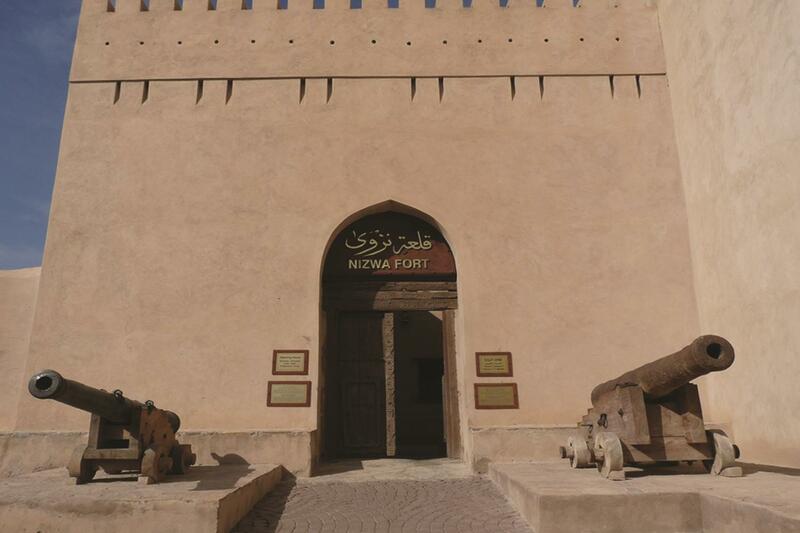 Learn everything about the local history and geography of the city when visiting the Dubai museum, located in the ancient fortress of Al-Fahidi. Another highlight will follow: you will use the local water taxis, called “Abras”, to cross the Dubai Creek. Enjoy the spectacular view of the city while heading towards the district of Deira. Here you will be enchanted by the large variety of exotic spices in the famous Spice Souk. Take the chance to get a unique and affordable souvenir when you visit the adjacent Gold Souk. We then proceed to Jumeirah area, where we will have a photo stop of the awe-inspiring Grand Mosque of Jumeirah. Built in the medieval Fatimid tradition, this stone structure is a tribute to modern Islamic architecture. After that, photo stop of Burj Al Arab hotel and continue to Atlantis hotel located at crescent of Palm Jumeirah. In the afternoon, transfer to the famous “Mall of the Emirates”, its biggest claim to fame is the Middle East's first indoor ski slope, Ski Dubai. With its indoor ski area, one of the largest in the world, the Mall of the Emirates seeks to differentiate itself from the dozen or so other newly completed malls in Dubai and the surrounding Emirates. Free time for shopping. In the evening OPTIONAL CRUISE DINNER (48$ PP)- Our shuttle bus will transfer you from the hotel for a cruise dinner on board of a traditional Arabian dhow. After the cruise, transfer to your hotel. Overnight in Dubai. Breakfast at your hotel. We suggest this morning to do a half day shopping tour at “Dubai Mall”. On the way, pass by the region of Burj Khalifa, the world's tallest tower and the centerpiece of the Gulf region's most prestigious urban development to date. 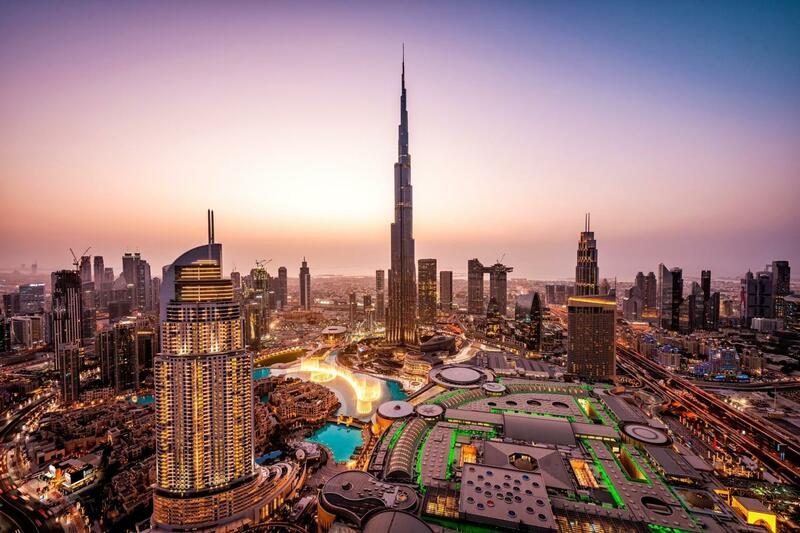 Burj Dubai will radiate out in a series of ellipses from the sky breaking tower encompassing residential, commercial, hotel, entertainment and the world's largest shopping mall “Dubai Mall”. Free time for shopping. With more than 1,200 stores and a host of world-class attractions; the Middle East region’s first Galeries Lafayette department store, France’s leading fashion house and one of the top 100 global retailers. The Dubai Mall is revolutionizing the modern shopping experience. With an impressive array of leisure pursuits, this is the ultimate, cutting-edge shopping experience. A range of adventure sports vies for attention alongside the romance of ice-skating. The Dubai Mall is a place where a 21st century gold souk is set off against a world class aquarium. Step inside The Dubai Mall and experience a place like no other. A climb to BURJ KHALIFA will be proposed to all our guests (optional). 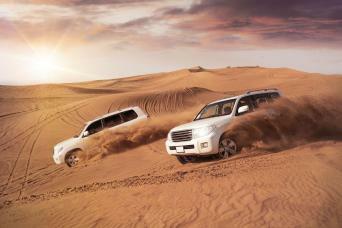 In the afternoon OPTIONAL Desert Safari - you will join a sharing desert safari. 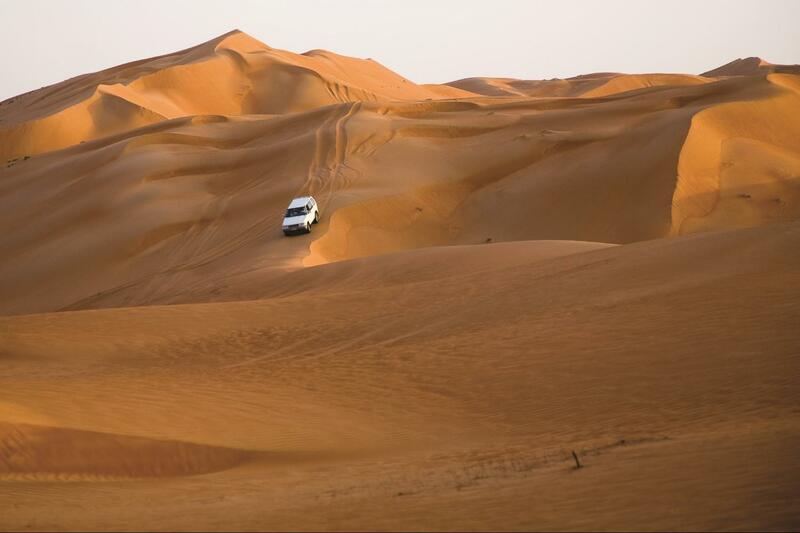 (pickup from hotel ) You will try on comfortable 4x4 vehicles to pass the endless and spectacular sandy desert. In the evening you will reach a traditional Bedouin desert camp. Where you will be having a BBQ-dinner in the sunset on the rhythm of traditional Arabic music, an unforgettable experience. In the late evening, you will return to your hotel. Overnight in Dubai. Breakfast at your hotel. Check out at 12h00 noon. Handover your vehicle to our Staff at a prefixed timing.